The demonstrators fear that the pipelines headed east and west from the Alberta oil sands, also called the tar sands, would accelerate climate change by enabling further development of this source of heavy crude oil. Any break in the pipelines would pollute lands and waterways, both inland and at the coasts. 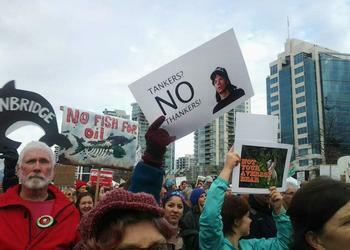 The largest turnout was in Vancouver, where some 2,000 people gathered in front of Science World to protest the twin Northern Gateway pipelines proposed by Enbridge, Inc. that would carry about 525,000 barrels of diluted bitumen per day from the Alberta tar sands to the BC coast for tanker shipment to Asian markets. The 1,170 km twin pipeline would run from Bruderheim, Alberta, to Kitimat, British Columbia. The eastbound pipeline would import natural gas condensate and the westbound pipeline would export bitumen from the Athabasca oil sands diluted with the condensate to a new marine terminal in Kitimat on BC’s central coast. In 2010, the National Energy Board established a Joint Review Panel to examine and report on the feasibility of the Northern Gateway Pipeline. Now the NEB is poised to announce its decision. “The No Enbridge Pipeline rally in Vancouver comes at a critical moment,” said Ben West, ForestEthics Advocacy Tar Sands campaign director. “Are they going to do this the easy way or the hard way, because we have not given consent for this pipeline and we won’t let it be built,” West declared. 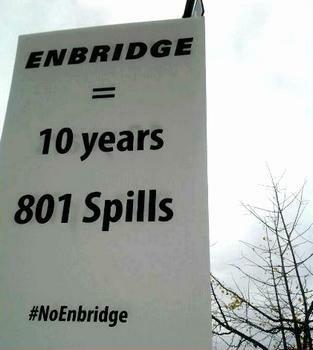 There is overwhelming opposition to Enbridge’s proposed Northern Gateway pipeline, with polls showing 80 percent of British Columbians opposed to crude oil tanker traffic on the BC coast. There is an “unbroken wall of opposition” of indigenous nations, with more than 160 First Nations putting their signatures on the Save the Fraser Declaration opposing tar sands exports projects through their territories. “There is no way we will let BC’s Premier flip flop on Enbridge; saying no to this proposal is as black and white as the orcas endangered by Enbridge’s reckless plans,” said West. Vancouver demonstrators also expressed their opposition to U.S. oil giant Kinder Morgan’s $5 billion plans to triple the capacity of its Trans Mountain pipeline, which carries crude oil from the Alberta tar sands to tankers in Vancouver. Objections center on increased tanker traffic into narrow Burrard Inlet, which already is crowded with cargo vessels. In Ottawa, nearly 200 people rallied outside of the office of Prime Minister Stephen Harper on a unusually hot fall afternoon to oppose the Energy East pipeline project proposed by TransCanada, the same Canadian company that wants to build the Keystone XL pipeline into the United States. The proposed 4,500-kilometer Energy East pipeline would carry 1.1 million barrels of crude oil daily from Alberta and Saskatchewan through Montreal and Quebec City, then on to Saint John, New Brunswick. An existing natural gas pipeline would be converted to carry diluted bitumen for export. The protest began on Parliament Hill and proceeded to the corner of Wellington and Elgin where protesters chanted “tar-free 613,” referring to the Ottawa area code, and laid sandbags, stemming a symbolic oil spill. The $12-billion pipeline project was endorsed by Harper, who heads a Conservative government, when TransCanada announced the proposal three months ago. In Montreal, about 300 demonstrators gathered at Oka National Park to protest the expansion of oil sands production and pipelines carrying the diluted bitumen east from Alberta. In Edmonton, Alberta, about 12 people tramped through the snow to demonstrate against climate change and the expansion of tar sands production at the Alberta Legislature. In the northern BC city of Prince George, close to 100 people took part in an anti-pipeline rally. Murray Minchin, who represents the Kitimat-based conservation group Douglas Channel Watch, said his group represents “ground zero” of the Northern Gateway pipeline proposal. “Essentially, this is the last chance for us to send a message to Prime Minister Harper that he really has to rethink this,” Minchin told CBC News. A new working paper produced by a Simon Fraser University researcher shows that most environmental protesters attempting to block oil pipeline projects, such as those proposed by Northern Gateway, are not radicals. They are mainly mainstream British Columbians, says John Axsen who authored the study. He is an assistant professor in SFU’s School of Resource and Environmental Management in the Faculty of Environment.